I am so busy, we can't decorated dolls this March. So my uncle sent this picture. 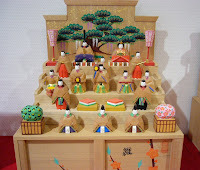 Hinamatsuri is the Doll’s Festival which is Japanese traditional custom for girls. I have only sons. I want to have really girls. 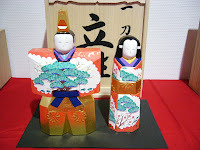 People in the past said, if you don't put your dolls into boxs early after the doll's festival, you can't not get marry. Actually, I got marry late. But I could get marry. Japan has so many fascinating festivals and customs..for us, Europeans, this is so strange and interesting. Thank you for the information, Lucy. Whatdelightful dolls, and what a wonderful festival Lucy. It is quite funny, on the 3rd of March this year, I sat there and decorated dolls with my girls. I did not know of your festival of dolls. We made clothes and bags and hats for them. I should make a photo of them and send it to you.